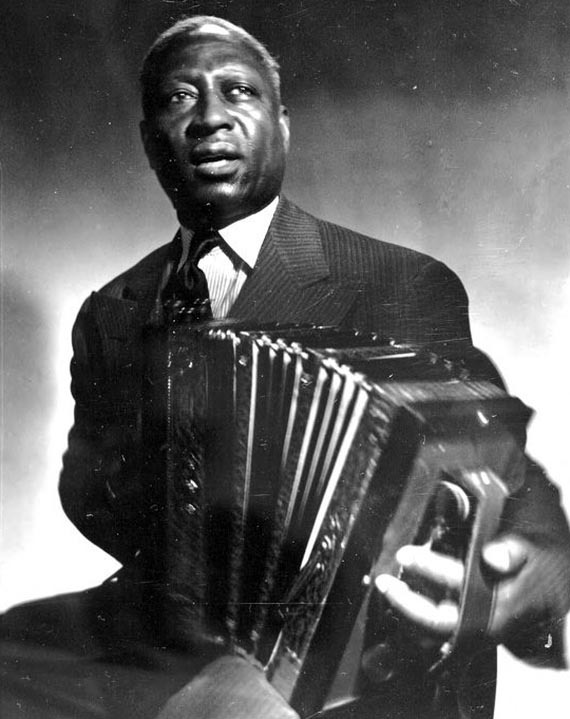 Following their 2012 success with Woody at 100, the folk music wizards of Smithsonian Folkways chose an even more ambitious project: a box set to represent the influential songster Lead Belly, a friend of Guthrie's who was less prolific as a songwriter but much more prolific as a recording artist. Lead Belly was the nickname of Huddie Ledbetter, a Louisiana native who sang, played several instruments, and had a prodigious musical talent. Unfortunately, he also had a temper, and he ended up serving time in prisons in Texas and Louisiana. In Angola prison in 1934, folklorists John and Alan Lomax recorded some of his songs. When he was released from prison, Lead Belly sought out John Lomax, worked briefly as his assistant, and then entrusted his musical career to the stately white Texan. After establishing himself in New York, he became a fixture of the folk scene, played with jazz and gospel musicians, and made a huge number of recordings. The five discs on Lead Belly: The Smithsonian Folkways Collection present a selection of the recordings that found their way to the label's archive: recordings made for Moe Asch at his Asch label, at Stinson, at folkways, and at various radio stations. It also includes a few recordings from the archive where I work, the American Folklife Center at the Library of Congress. Selected and annotated by co-producers Jeff Place of Smithsonian Folkways and Robert Santelli of the Grammy Museum, the box follows a similar pattern to the Woody set: Discs one and two present Lead Belly's greatest hits. The third mixes hits and rarities. The fourth CD presents radio shows, many of them never released before, and the fifth presents a selection from his famous "last sessions." 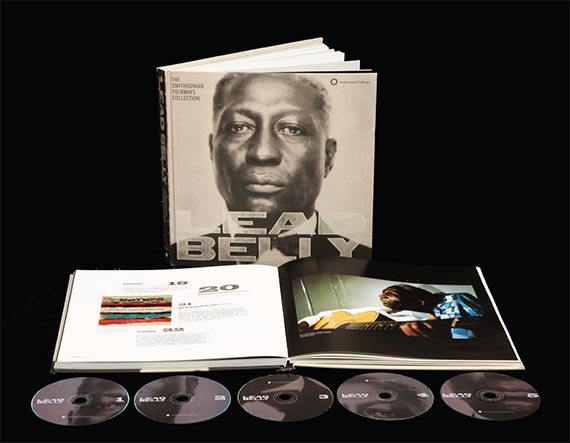 In all it presents an engaging and fascinating portrait of Lead Belly: broad enough to cover all the bases, deep enough to present both legendary performances and oddities, with sixteen never-before-released selections. Lead Belly claims in one of the radio shows that he can "sing 500 songs without going back to first one." If that was true, this presents only about a quarter of his prodigious repertoire...but I wouldn't bet on that. The songs are a vast and varied banquet of Americana cooked up and served through the genius of one man. 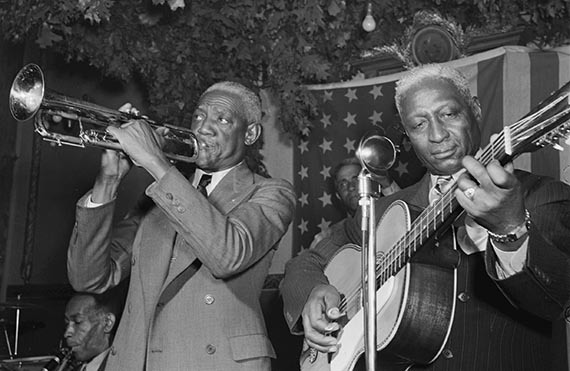 Whether they're pieces he learned from his uncles ("Goodnight Irene"), picked up from fieldwork ("Rock Island Line"), gleaned from movie cowboys ("Springtime in the Rockies"), or wrote himself ("Fannin Street"), Lead Belly made every song his own. His twelve-string guitar playing could be deceptively simple, as on "Ha Ha Thisaway," or chaotic and complicated, as on "Gallows Pole." His button accordion playing on "John Hardy" and other pieces acts like a blues guitar, providing chords under the singing, then answering back with occasional verses of its own. Friends such as Woody Guthrie (mandolin), Cisco Houston (guitar), Sonny Terry (Harmonica) Brownie McGhee (guitar) and Pops Foster (bass) fill out the arrangements on some of the songs. and is in the public domain. Of course, Lead Belly's greatest asset was his voice. It's at once powerful and painful, a hard-living voice that can whoop with joy, wail with sorrow, or coax a chuckle from a child. He could sound surprisingly innocent on a kids' song, or he could turn around and be a hard-drinking bluesman--a trick he had perfected in real life as well as in song. Perhaps the most surprising piece, "Excerpt from 'The Lonesome Train'" finds Lead Belly playing the part of a rural preacher, bookending the beautiful cadences of his sermon with verses of a song about Abraham Lincoln. How influential was Lead Belly? Since The Weavers had a number one hit with "Irene" in 1950, the year after Lead Belly died, an unending array of musicians have covered his songs, from Johnny Cash to Led Zeppelin and from Nirvana to The Beach Boys. On this set you'll hear the original songs that inspired them all. Unlike his friend Woody Guthrie, Lead Belly was not a visual artist as well as a musician. So to make the box as sumptuous as Woody's they needed lots of pictures, and they found them in the John Reynolds Collection, the Library of Congress, and elsewhere. The use of relevant documents as well as photos, and a pleasing design sensibility, add up to a great-looking, readable package. A further delightful aspect of the set is the writing. Both Santelli and Place contribute thoughtful and interesting essays setting Lead Belly's life and music in context. Along the way, they clear up many misconceptions about Lead Belly, beginning with his name. Originally spelled as two words, it was later often rendered as "Leadbelly." While the singer didn't complain about any positive publicity, he (and now his family) always preferred the original spelling, which is restored by this release. Lead Belly's given name was "Huddie," and another popular error is to rhyme it with "Buddy." It was properly pronounced "HUGH-dee," and people who knew him sometimes even wrote "Hughie." When he spoke fast it could sound like "WHO-dee" or even "hoodie." The box set provides several songs in which he says or sings his name, including "Fannin Street" and "Governor O.K. Allen," which give the range of acceptable pronunciations. One misconception the set may perpetuate is the story that Governor O. K. Allen of Louisiana pardoned Lead Belly in response to a song recorded and delivered by Lomax. Santelli's essay tells this story uncritically, while Place's suggests with a sly wink that it may be true, stating that Lead Belly was "officially granted a pardon" after the song was delivered, but acknowledging that the state disavowed a causal connection. In fact, though, Lead Belly's sentence was commuted on the basis of a good behavior provision called "double good time," which applied to most prisoners. The commutation was contingent on staying out of trouble, so technically he wasn't pardoned at all. Although initially both Lomax and Lead Belly believed the song had bought Lead Belly's freedom, Lomax learned the truth six months later, and his family to this day takes no credit for Lead Belly's release. Notes on the individual songs are well written, engaging, and mostly accurate. There are occasional errors, though, such as the claim that Lead Belly first heard "Rock Island Line" in Gould, Arkansas in October 1934. In fact, he had heard it from another group two weeks earlier in Little Rock, a fact Place could have discovered by consulting the American Folklife Center's online card catalog or the Association for Cultural Equity's Lomax and Lead Belly Timeline. Place has elsewhere given "Rock Island Line" as an example of Lead Belly learning a song after having heard it just once. This suggests a fascinating pattern to the few inaccuracies I've noted above: Lead Belly singing his way out of Angola, Lead Belly rebelling against the exploitation of the prison stripes, and Lead Belly learning one of his most famous songs in one hearing... they're not so much mistaken as mythic. We suspect they may not be true, but we tell them in hopes of expressing deeper truth: Lead Belly's life was a narrative of mastery and resistance, like Zora Neale Hurston's High John De Conquer or folklore's John Henry. With these mythic stories, he becomes a superhero of American history and a Founding Father of African American music. In real life, he was all that and more.